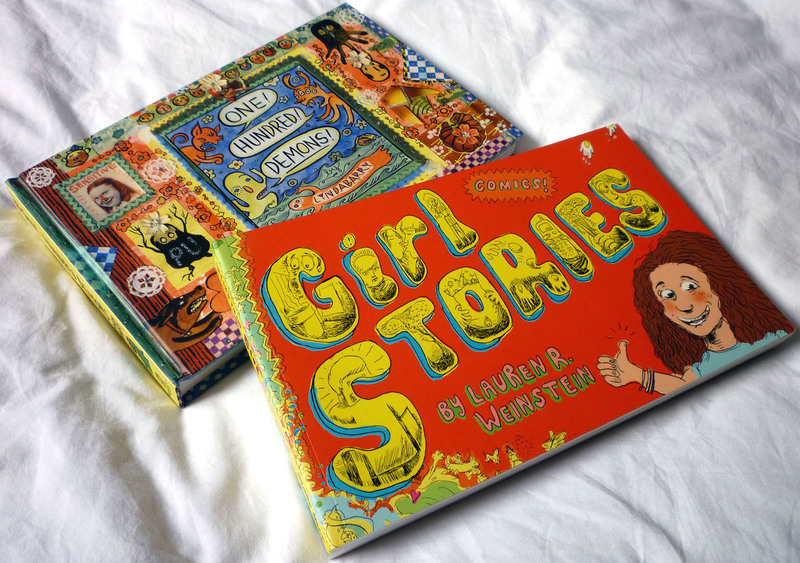 Girl Stories by Lauren R. Weinstein, published in paperback by Henry Holt in 2006, and One Hundred Demons by Lynda Barry, published in hardback by Sasquatch Books in 2002. Aha! I hear you cry. He's grouped these two graphic novels together because they're both by women. Oho! I rejoin. That is only part of the reason. In fact my major rationale for grouping the two books together is even more prosaic than that: when I retrieved them from the loft it struck me that they're both in a landscape format, and almost exactly the same TPS – about 150mm by 240mm. Slightly more interestingly, both books are episodically autobiographical in nature and deal with similarly formative periods in their authors' lives, so despite my facile comparisons they do share more in common than just gender and size. Of the two, I liked Girl Stories the best. Why it took me nearly ten years to finally read the damn thing I've no idea; I've long loved Weinstein's idiosyncratic, unpredictable Inside Vineyland (Alternative Comics, 2003), and though Girl Stories isn't quite as demented as that debut, it has the same zip and energy, just directed to keenly felt, scratchily rendered vignettes of school life and suburban home life (instead of stories about lovelorn robots and depressed dogs), with meditations on the perils of social climbing, the trouble with boyfriends and the problem of body fascism. It's taken me even longer to get round to One Hundred Demons – over a dozen years, which is ridiculous really. I mean, what's the point in even owning a book if it's just going sit there unread for a dozen years? He types, looking round guiltily at the hundreds of books sitting on his shelves unread for half a dozen years. 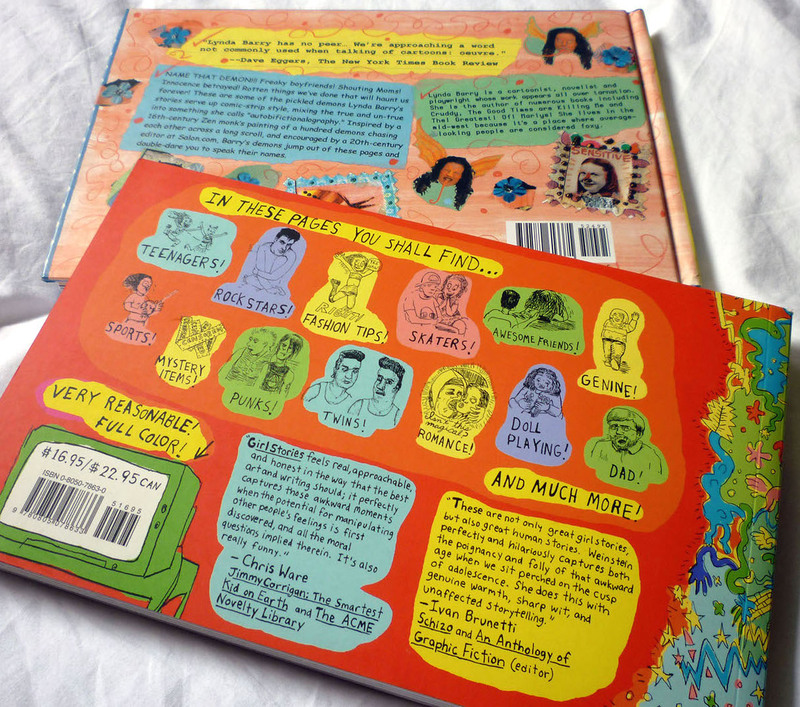 But anyway: Barry's comics are as honest and raw as Weinstein's – rawer even: there are allusions in One Hundred Demons to a very dark and painful episode in Barry's childhood. As a cartoonist, though, Barry prefers to tell rather than show, to the extent that the words in her panels frequently overwhelm and crowd out the pictures. That said, she may lack Weinstein's light touch, but there's a reflective strength, and consequently an affecting depth, to a story like "Cicadas".